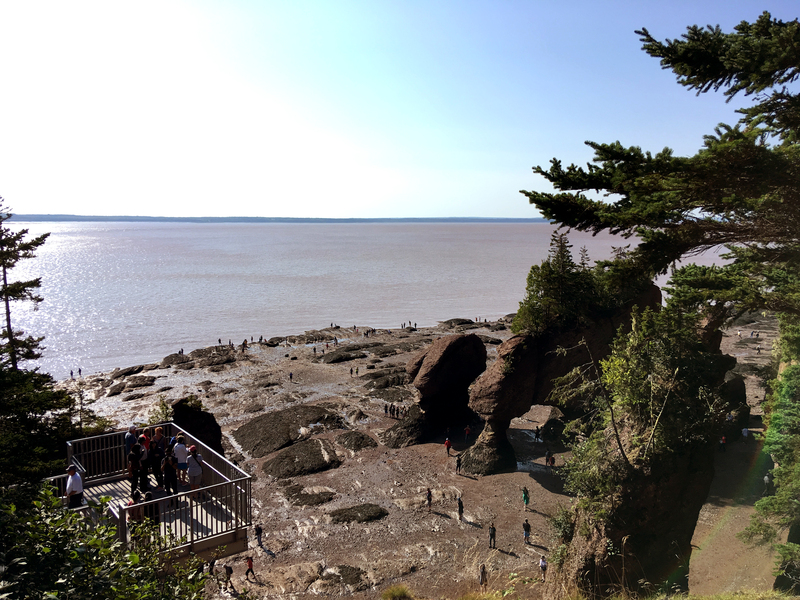 Walking on the sea floor at Hopewell Rocks while the Bay of Fundy’s tide rolled (more like sped) in and out in Alma, New Brunswick. With Québec in the rearview mirror, we crossed into the Atlantic time zone and our first province of the Maritimes: New Brunswick. We were on a mission to get to the Bay of Fundy so only a brief pit stop was made in Edmunston to top up the gas and admire how lovely-ly the landscape was changing from central Canada. Things started to get really hilly and lush since we were still fairly inland from the coast. Driving through NB, you’ll notice two things: first, all the signs are completely bilingual. Personally, we think that all of Canada should be like that since it helps people from all over the country feel unified and you might even pick up a few things on your daily drives. To clarify, NB is the only officially bilingual province so they’re required to have all signage in English and French by law while other provinces aren’t required to do so. Anyway, the second thing we noticed is that there were a lot of road signs with claims about being the potato capital. Ok, those are some pretty great awards and titles to have but we all know that despite McCain‘s prominence in the potato world, PEI holds that crown. “Potato country”, “French fry capital” and “world famous potatoes” were all proclamations made on roadside signs that contributed to this potato propaganda. Although I’d need to see the official documentation to back these statements up to truly believe them, all the talk about potatoes and fries made us realize that we were going to feel right at home in New Brunswick. 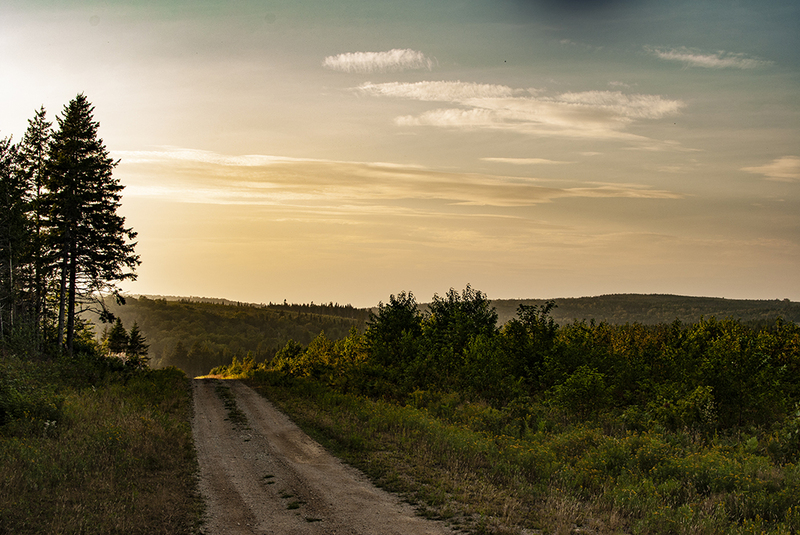 After zooming through Fredericton and making an unsuccessful attempt at getting some Sussex Ginger Ale in Sussex, we settled into a forest road campsite just outside of Fundy National Park for the night. It was a beautifully treed area that had this mystical sort of haze floating around that made it look pretty magical. 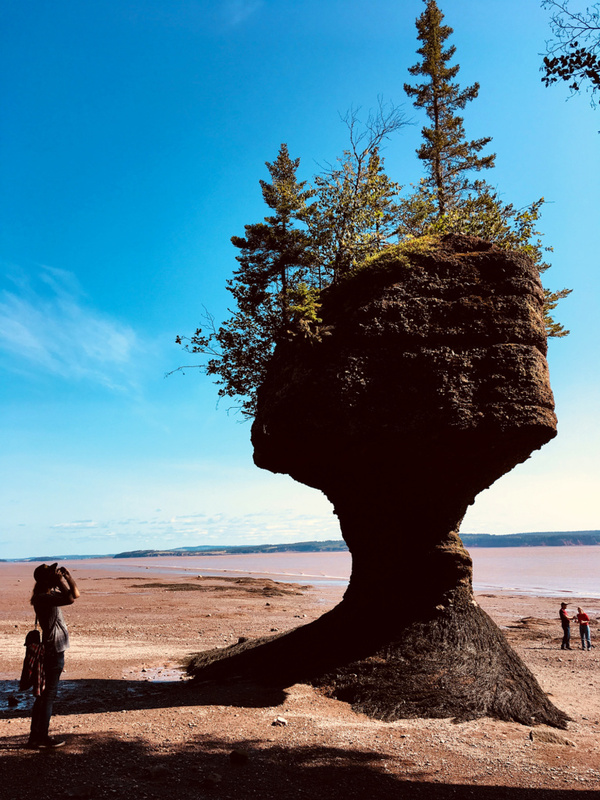 Our goal was to get to the Hopewell Rocks for low tide bright and early the following day so it was the perfect spot to get a good night’s sleep before having to wake up at the asscrack of dawn. On the way to Hopewell, we went through Alma, which is a cool little seaside town where we got our first view of just how crazy the tide really is. 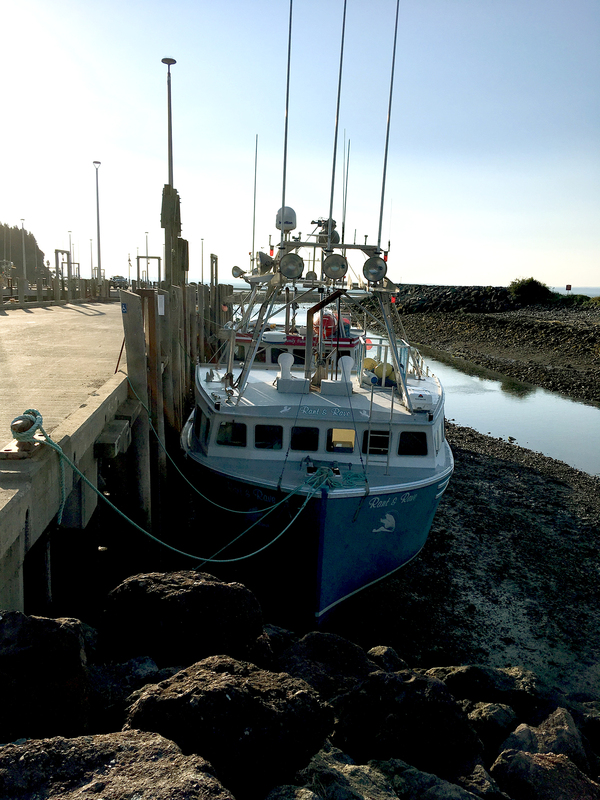 Huge fishing boats were completely out of the water and you could walk out at least 100’ beyond them. 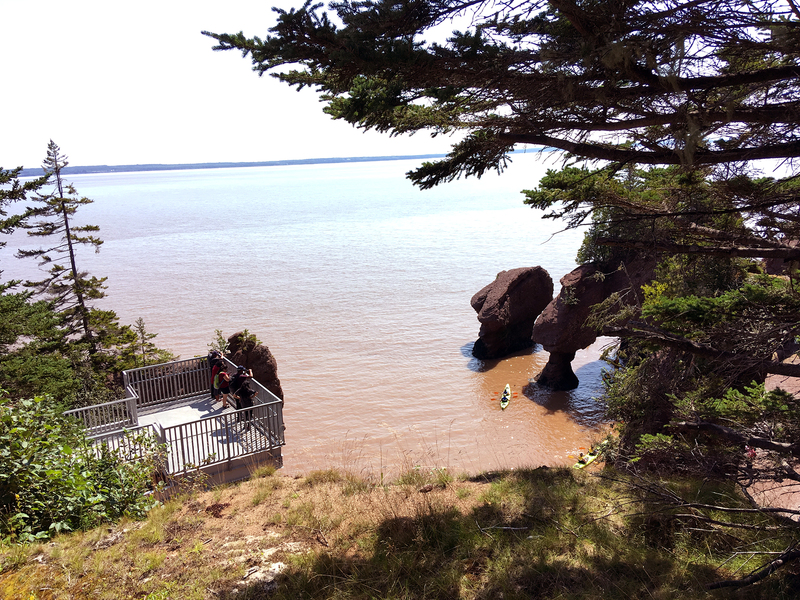 Once we got to the park, we could see people exploring the exposed sea floor way out beyond the steps to go down. We climbed down and checked out all the seaweed and flowerpot rocks that make the place so famous. The flowerpot rocks are also really good indicators of how much the tide changes – at 9AM we were walking at their bases and by 1PM, they were starting to get submerged. We walked out about 1km/0.6mi and the sand started to turn into quicksand-like mud. 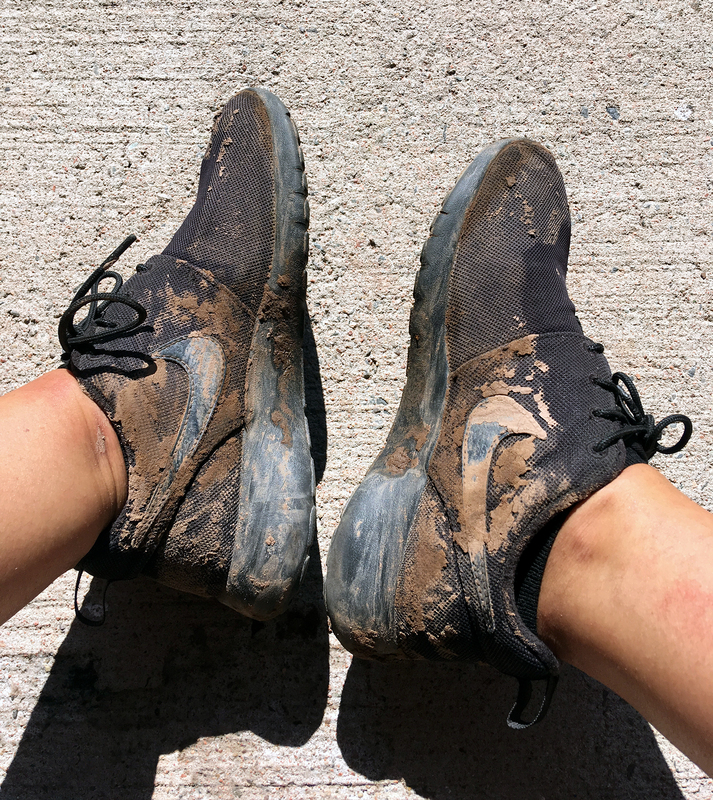 I wanted to feel just how sticky it was so I crossed into some and almost lost a shoe. It’s clear that those areas are where the tide line usually hangs out since it’s so much wetter than the sand closer to the cliffs. I found it really interesting how little sea life there was other than seaweed but I suppose with a tide that aggressive, it would be hard for little creatures to survive. It’s very different than a lot of west coast beaches where you dodge crabs and mussels as you walk out. We stayed until an hour before high tide and the fluctuation was drastic. People were no longer allowed on the beach simply because there’s nowhere to walk; the beach completely disappears and gets filled in with water. Apparently a lot of ignorant people have gotten stuck from walking too far and not being able to find enough dry land to get back. The unique thing about the Bay of Fundy is that with the tide changing so quickly, it transforms the look of all the towns that it touches in New Brunswick and Nova Scotia alike. People can even rent kayaks at high tide to explore the rocks that they were just walking alongside on the formerly dry sand. 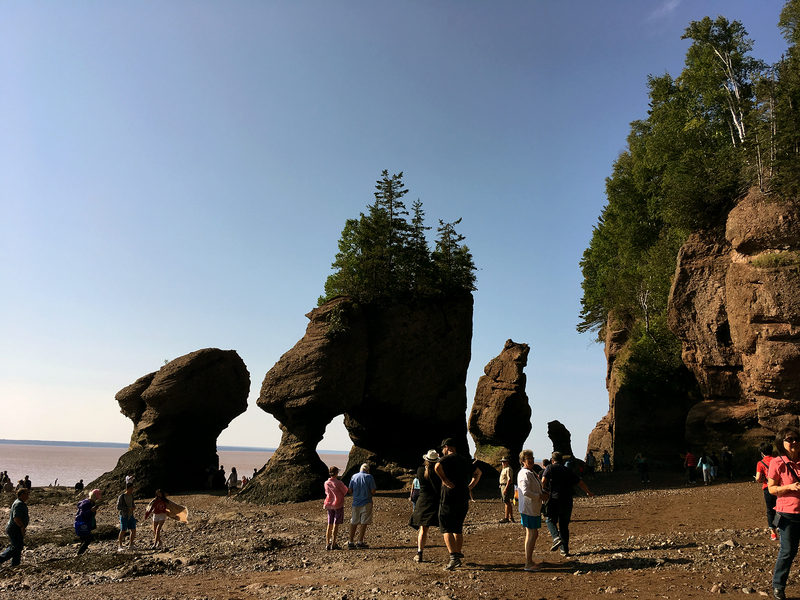 I’m going to refrain from subjecting any of you to the fun/Fundy jokes and just say that we had a wicked time in New Brunswick and that the Hopewell Rocks…rocked! Ouch, sorry. After leaving the park, we booted through Moncton to head toward the Confederation Bridge to Prince Edward Island and hit up our first island in a while and take Clemie further and further east.